Stuart Low is a Scottish landscape photographer who is passionate about trees, old ruins and shoots film. “Treescapes” is my latest exhibition and is on display at Ocean Terminal, Leith, Edinburgh, which runs from 21st July till 31st August 2016. Ocean Terminal’s open gallery space is a new initiative being run by the Image Collective that was launched in 2015 to showcase the work of both known and first-time exhibitors. The exhibition brings together a small selection of photographs of trees in the landscape that I have been studying for the last 30 years. The exhibition also doubles as a preview for my book of the same title “Treescapes” which is due out in September 2016. I was brought up in part of the Scottish countryside that is very rich in tree life and because my family were farmers, I had a fantastic arboreal playground lose myself in and I subsequently developed a deep fascination for trees. It was when I received my first camera however, a Kodak Instamatic, for my 14th birthday that my fascination with trees was to grow into an obsession. From that day onwards, every penny of my pocket money was spent on 126 film so I could go outdoors to capture images of the trees where I lived, and it wasn’t too long before I’d filled up a few albums with 2 inch square prints. At every opportunity, I would be outdoors seeking the most interesting specimens to capture on film but back then I had no idea what I was doing. I didn’t know how to compose, I never waited for the light and I ended up photographing many of the same trees over and over again, so I ended up with a fairly uninteresting collection of images. I was too young to realise it at the time, but whilst I was capturing these same trees many times over, I was actually laying the foundations that would document their transformations as the seasons and years passed, and I would come to realise this several years later. Photography took a back seat for a while and it wasn’t until I was about to go to University that I bought my first slr camera, and began to learn photography properly. I was originally primed to go to art college but at the last minute I decided to switch and study the sciences instead. I’m ever so glad I did because it was to have a huge influence on my photography from then on. Thanks to a physics class, where the subject was ratios and fractals, all my tree photographs made sense and this was to be my epiphany moment. With this new found knowledge, everything I looked at in nature became more beautiful than I ever thought possible. Ratios were everywhere and it dawned on me that they weren’t just numbers or something in an exam question any more, they were the tools I would use to teach myself composition and stamp my own identity on my images. I’ve chosen to present them as a diverse collection of unique trees where the viewer can notice the bent trunk of the rowan tree covered in sheep’s wool or look at those scorched branches of the sycamore and imagine how it might have looked before its transformation. I spent many years applying ratios to my compositions and I still do today, but never just for the sake of it. The ratios I applied were always carefully considered and they had to have a sincere emotional connection to the trees, otherwise the image wasn’t likely to connect with the viewer. In the exhibition and book, the emotional connections come from the various transformations I’ve captured over the years. Trees undergo constant transformations day after day but they are barely noticeable unless you document the changes over a season. But these images aren’t about a single season, they are about many years of study and many different types of transformation so I’ve specifically chosen not to present the trees as a before & after series. I’ve instead chosen to present them as a diverse collection of unique trees where the viewer can notice the bent trunk of the rowan tree covered in sheep’s wool or look at those scorched branches of the sycamore and imagine how it might have looked before its transformation. 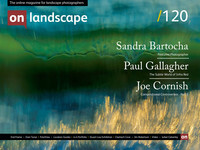 Do you have an exhibition, project, trip report or location review that you would like to submit an article on to On Landscape? We'd love to hear from you! Please submit our submissions form and we will get in touch.